Actually we planned to just relax in the coastal town Guarapari South of the capital of Espírto Santo – Vitória. 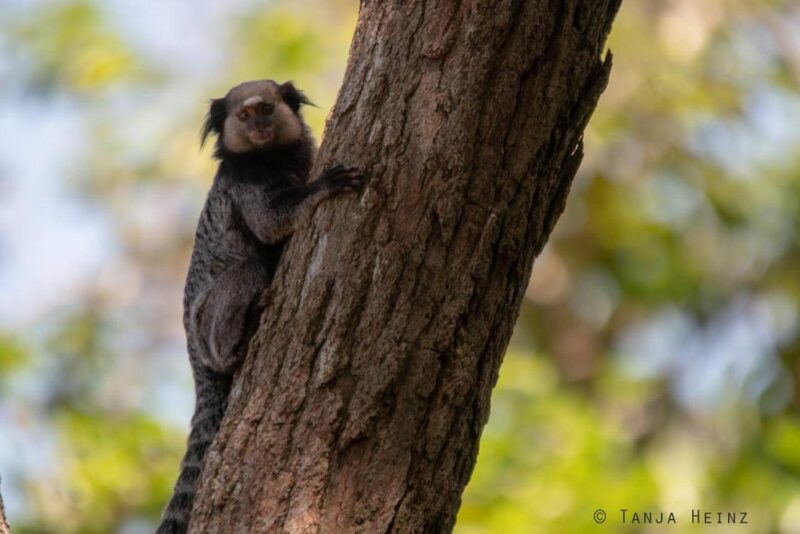 After our encounters with Black capuchins (Sapajus nigritus) in the Feliciano Miguel Abdala Natural Reserve, the crested capuchins (Sapajus robustus) in the Reserva Natural Vale and the Geoffroy’s marmosets (Callithrix geoffroyi) on the Morro da Penha in Vila Velha, it was time for us just to give ourselves some time to rest before we would start to our next animal encounters. 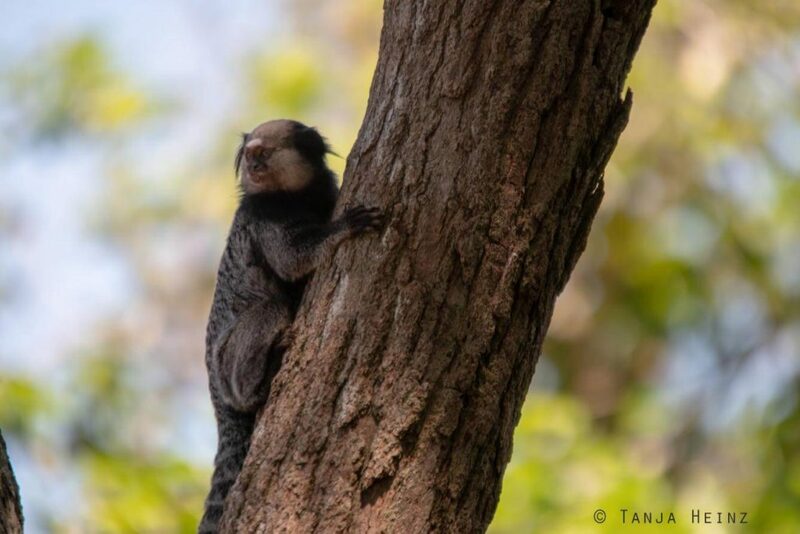 Like in Vitória I had no hope of seeing (many) wild animals, as Guarapari is a popular vacation spot among Brazilians. 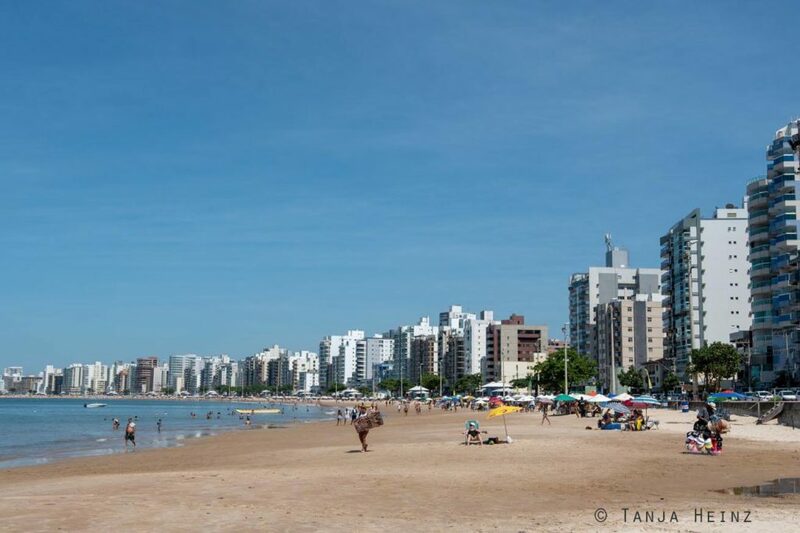 Sun, beaches and restaurants characterize Guarapari. But actually in Brazil you can find anywhere and anytime very spontaneously wild animals. One example is the first morning after our arrival at our pousada (guest house). As in the morning I spotted small little monkeys on a wall. 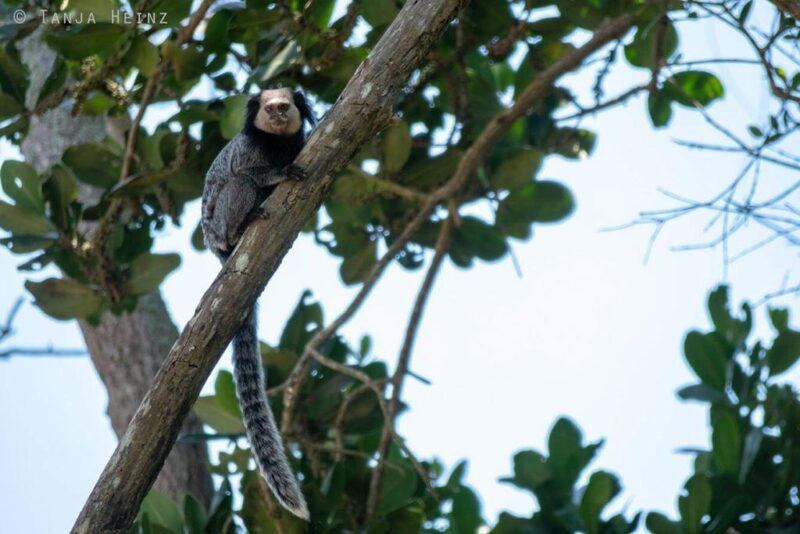 Thery were Geoffroy’s marmosets (Callithrix geoffroyi). When they saw me they immediately looked into my direction. One of them left. The other little monkey stayed on the wall and kept looking into my direction. However, this little monkey neither appeared to sit itself comfortably down. I stayed in my hammock on our balcony and I hoped to be able to observe this little monkey as long as possible. 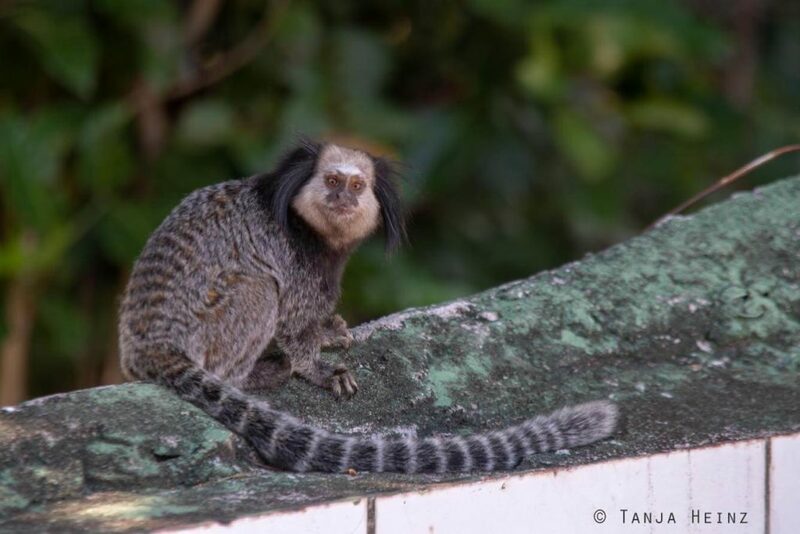 Since my last encounter with Geoffroy’s marmosets on the Morro da Penha in Vila Velha I still had many, many questions to be answered. 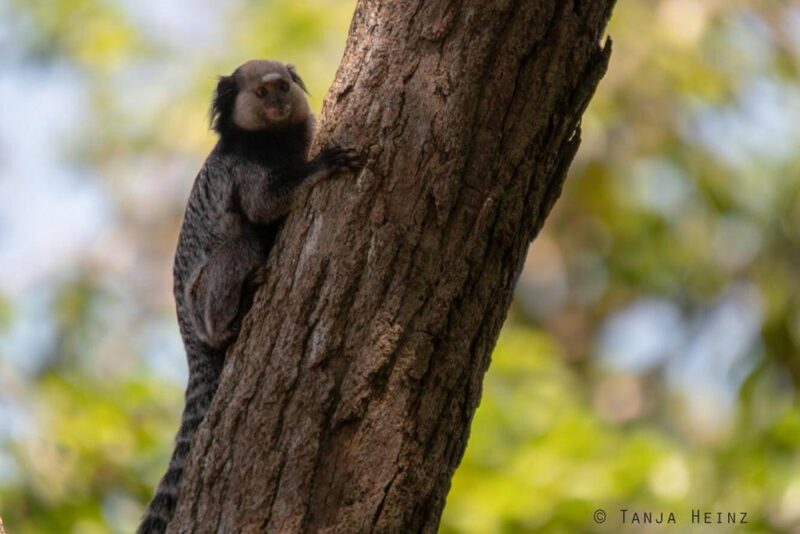 If you know the article about Geoffroy’s marmosets then you know hat these little monkeys are not endangered according to the IUCN. But anyway, they have a very small distribution range. They only occur in Espírito Santo, Bahía and Minas Gerais. They do not live in other regions. Usually these little monkeys live in groups of about ten individuals. Indeed I saw a group of about ten individuals on the Morro da Penha. 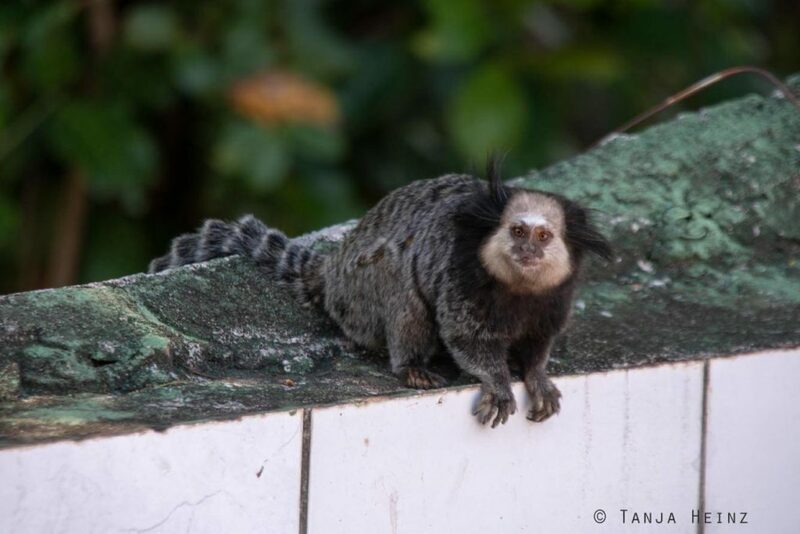 But on this morning in Guarapari I only saw two of them. When the smaller monkey of them left, they other little monkey stayed a little bit longer but then left as well. I sat alone on my hammock again. Maybe they come back? I thougt. The sun was already shining but it was not yet hot. I enjoyed the morning in the hammock. But the little monkeys did not come back. 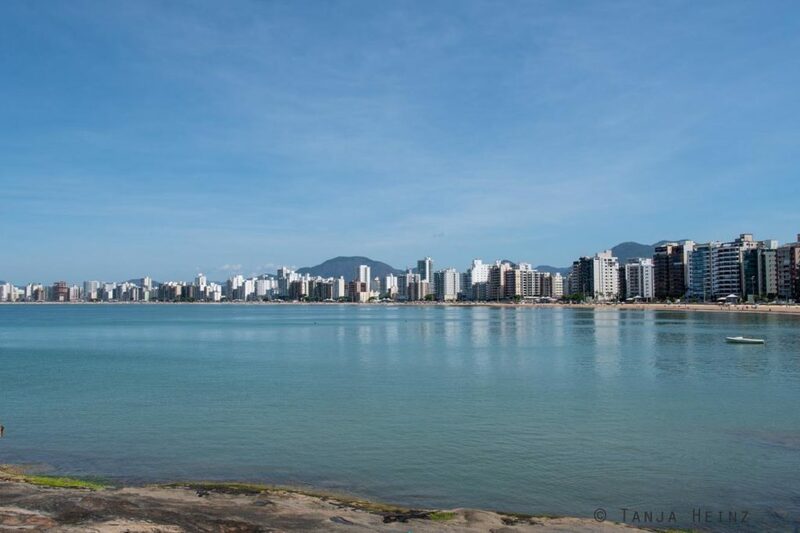 So we started our day in Guarapari to explore this coastal town of Brazil. 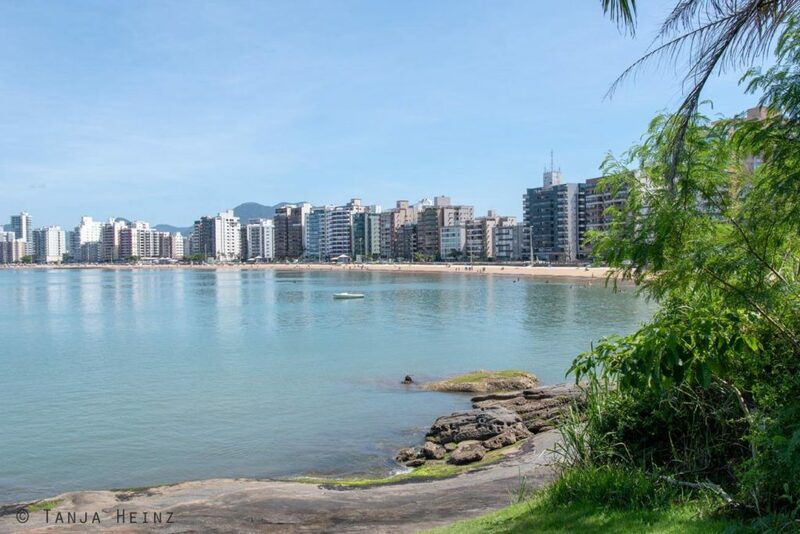 For Brazil Guarapari is rather a small city with its roughly 100.000 inhabitants. The city is about 60 kilometers from Vitória and easy to reach by bus. 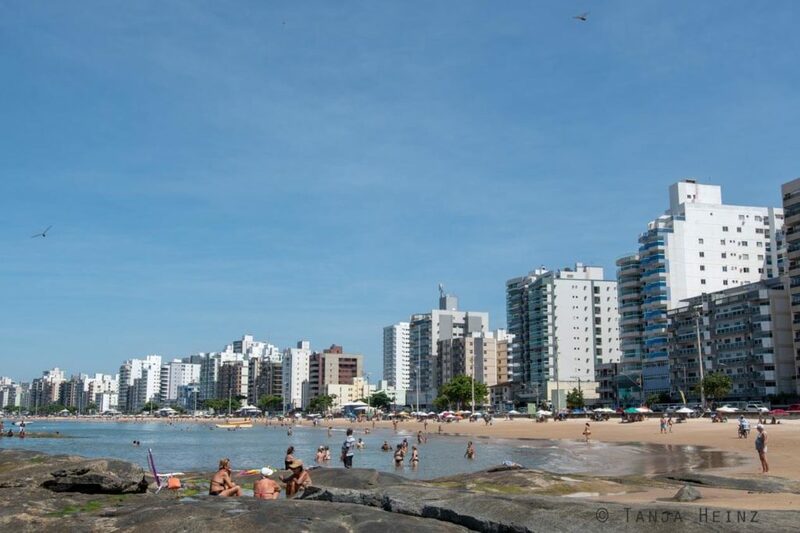 Guarapari is a popular vacation spot among Brazilians. Beaches are surrounded by many high buildings. 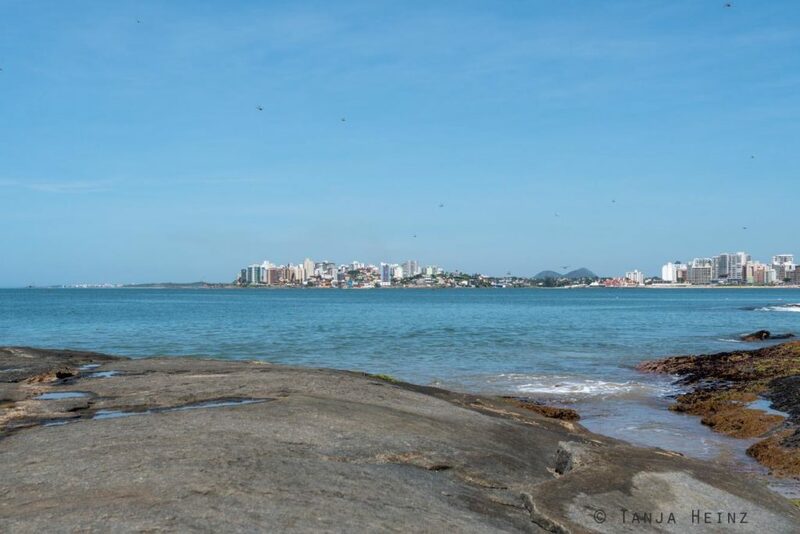 Although we had been in Guarapari in March, that means in autumn, there were many people on the beach at the Praia do Morro. On the beach you cannot miss the statue of a blue marlin. The blue marlin (Makaira nigricans) is a predatory fish that lives in the Atlantic. 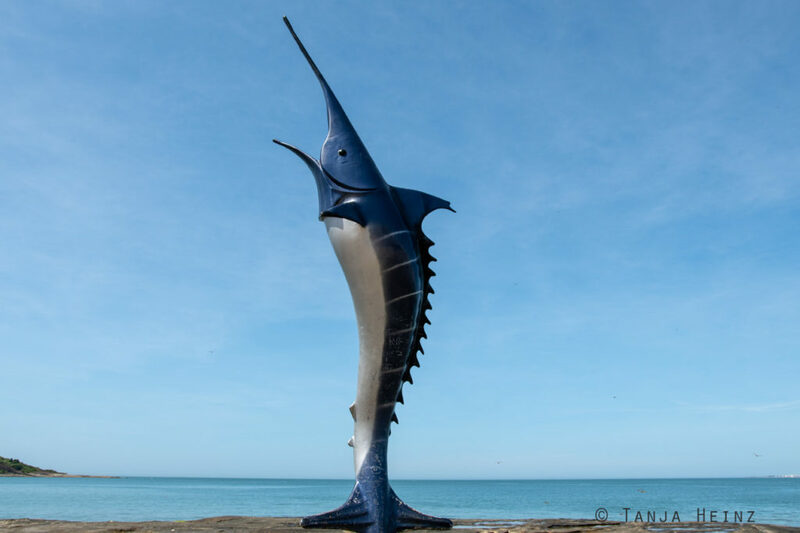 It is the symbol of the state Espírito Santo as blue marlins are/were important for the fishing industry. But according to the IUCN the blue marlin is „vulnerable“. After visiting the statue, we looked for nice trails close-by. At first we left the beach and we sat in the shadow of some trees. From there we got another view of the coastal town Guarapari. I went closer to the water after some rest in the shadow. At the water I met some especially attractive birds. 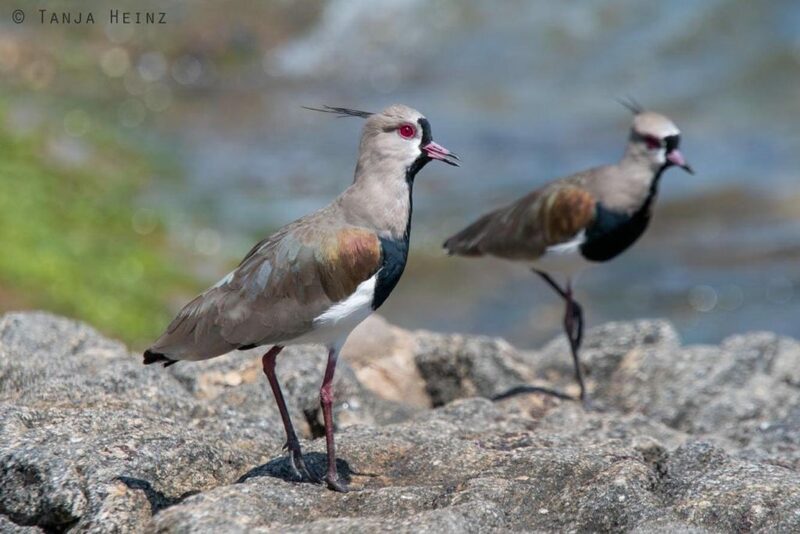 That means two Southern lapwings (Vanellus chilensis). They are relatively easy to recognize with their grey head plumage and their black streaks from the head to the chest. I became aware especially of their raspberry-red eyes. 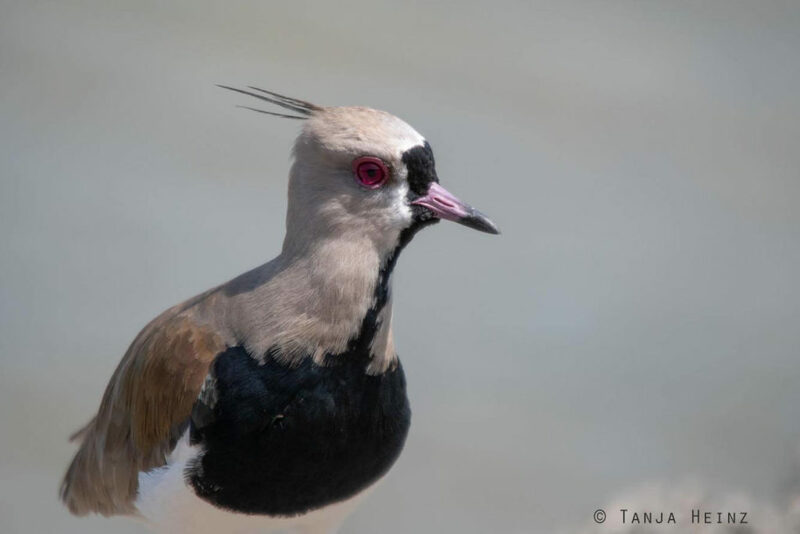 According to the IUCN the Southern lapwing is not endangered, and thus, listed in the category „least concern“. Accoring to the World Conservation Union they have a very broad distribution range. 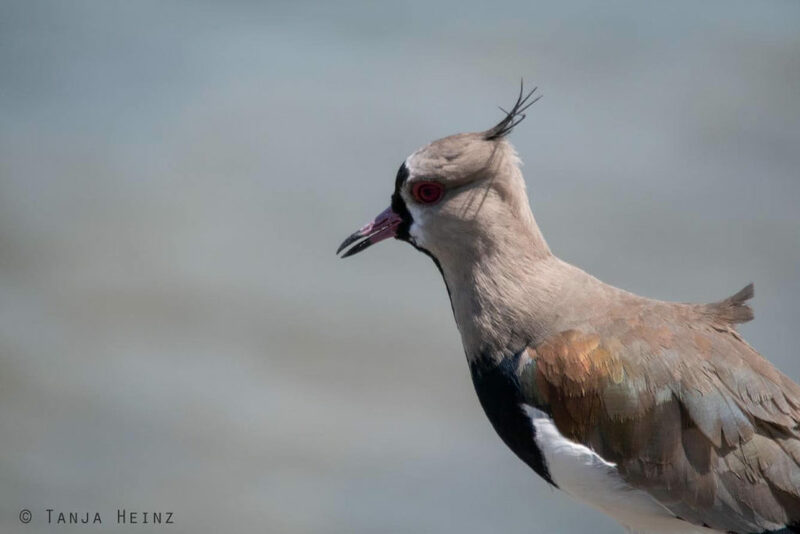 This is why I met so many Southern lapwings during my journey through Brazil. 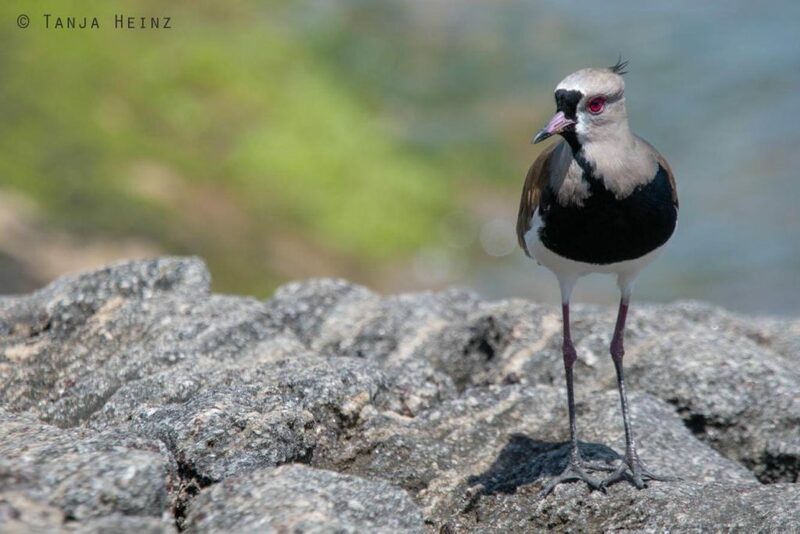 I met Southern lapwings in Itaúnas, but also in Ubatuba in São Paulo and at the Iguaçu Falls. Still impressed by their red eyes, we left and walked into the direction of the Parque Morro da Pescaria. 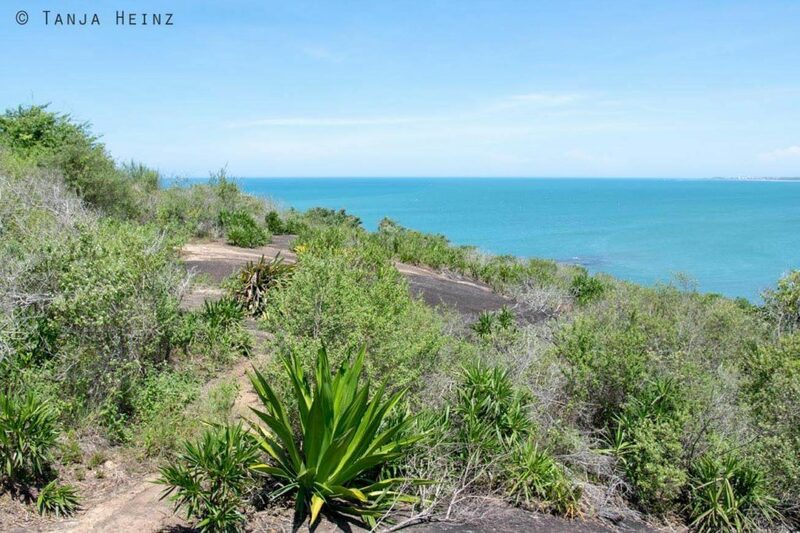 The Parque Morro da Pescaria is a small green oasis in the vicinity of the Praia do Morro in Guarapari. 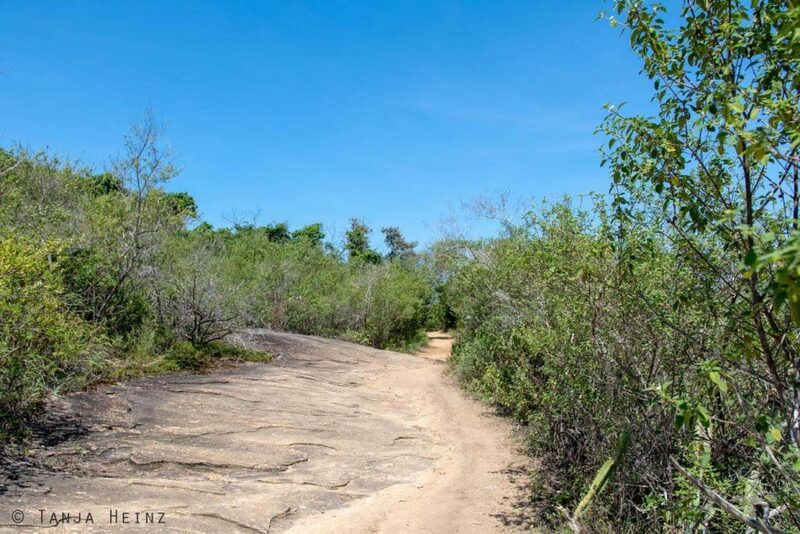 There are trails along the sea on the Morro da Pescaria. As the name “morro” in Portuguese suggests, the Morro da Pescaria is a hill. Easy paths lead lightly up and down. 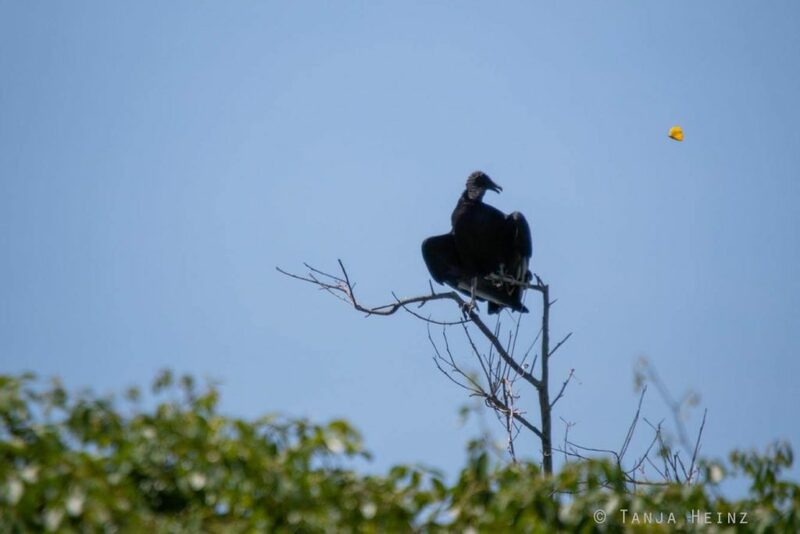 On our path we met some solitary black vultures (Coragyps atratus). I met especially many black vultures already on the Morro da Penha. 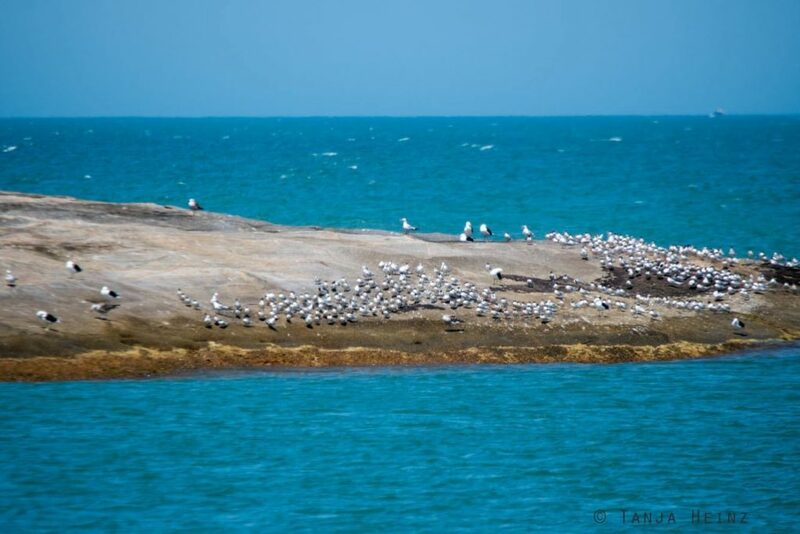 When we achieved walking around the half of the Morro da Pescaria, we spotted a colony of seagulls on the Ilha da Raposa. However, immediately another bird became my full attention. And that was a plover. As fast as it came, as fast it vanished again. But the plover appeared again and again on our path. However, when it saw us, it fled from us immediately. 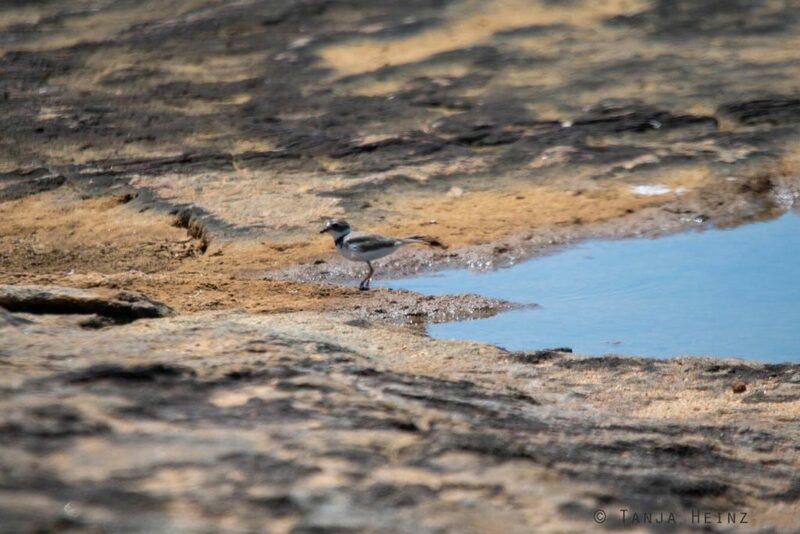 Was this plover maybe a Semipalmated plover (Charadrius semipalmatus)? I was especially happy when I spotted a sea urchin. I’m not a sea urchin expert at all. 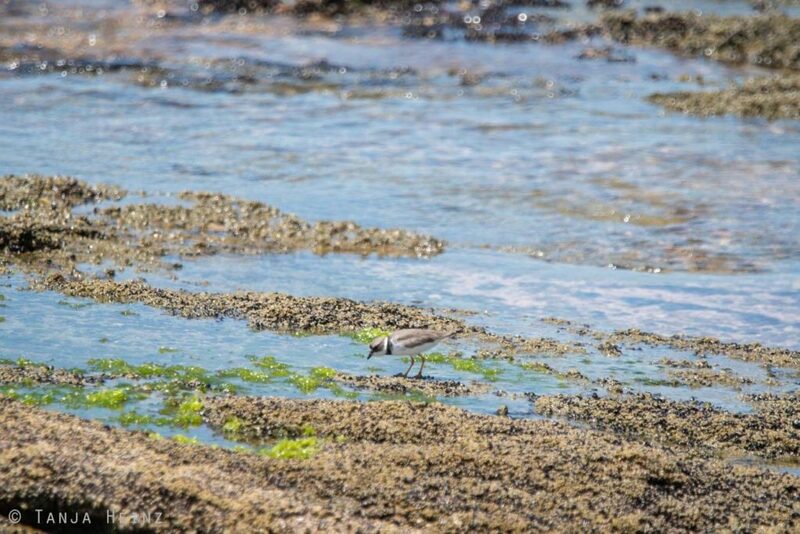 But I remember quite well from my biology studies that environmental conditions are very harsh in tidal areas. 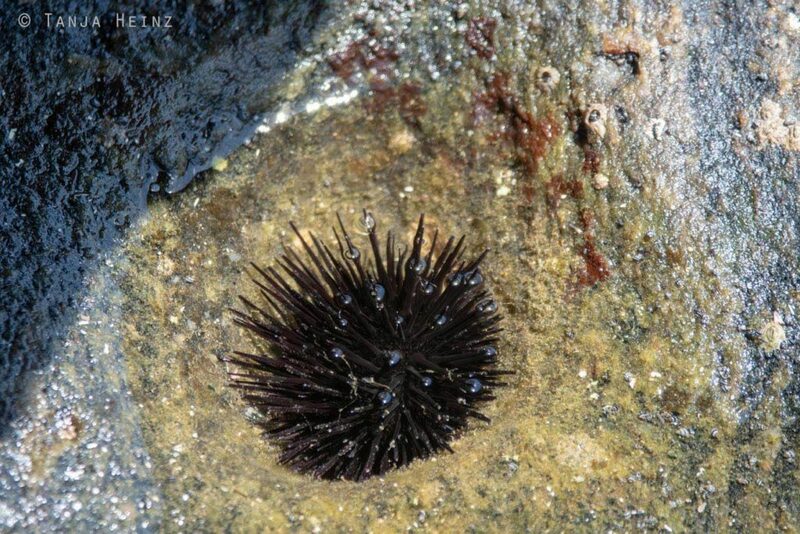 And this sea urchin was living in a tidal area. As environmental conditions are very variable in tidal areas, organisms are exposed to freshwater and sea water, for example. But also temperature can change quite rapidly. Thus, organisms have to find ways to survive very high and very low temperatures. When we left the sea urchin again, we came closer to a forest area where we found a small, but closed snack stall. At the beach a group of Brazilians took a bath in the water. 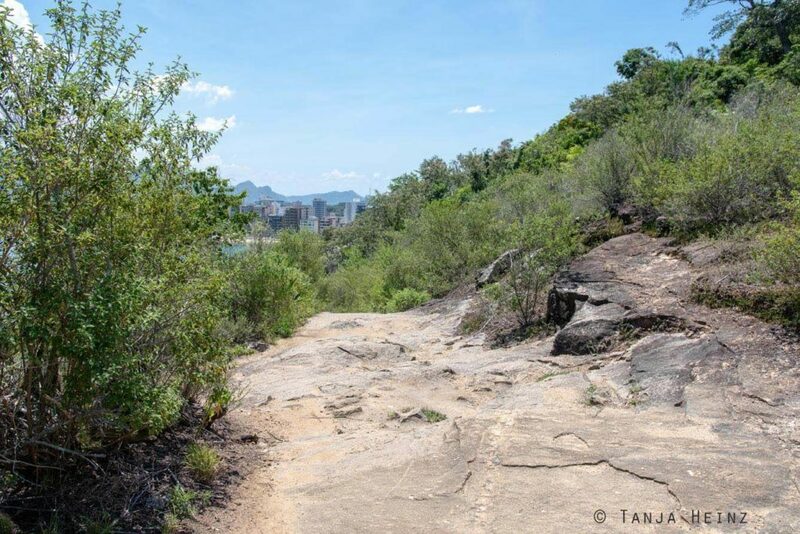 In general we met few visitors in the Parque Morro da Pescaria. Only occasionally we encountered some people on our way although the Morro da Pescaria is relatively small. We walked about five kilometers along the coast in the Morro da Pescaria. We were just about to sit into the sand under some trees when I heard some branches moving. This time I indeed met a group of them. However, only two of them were close to me and stopped. The others were moving. Apparently, the whole group was moving. It did not appear to me that the group was about to rest. One of the two little monkeys rested for a few seconds at a tree trunk. It looked to the left. Then it looked to the right. And then directly into my direction. As it was in the middle of the day and the contrasts in my photos were very high, I was more busy handling my camera than enjoying another encounter with Geoffroy’s marmosets. And then the monkey left. And I got angry with myself as I was so distracted with my camera. The little monkeys vanished in the bushes close-by. We stayed some more minutes in the shadow. And finally made it equal like the little monkeys. Finally we reach the path that led to the entrance again. 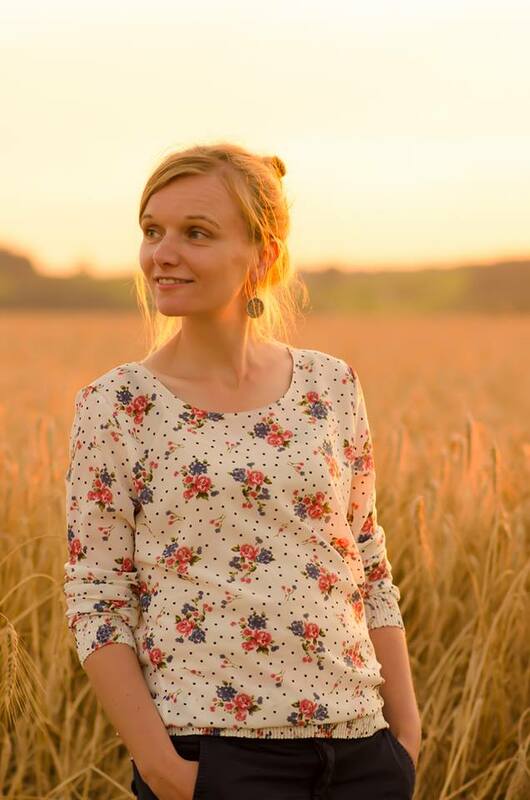 I could remember the landscapes. The path led us over sand and stones. Sometimes the area was flat. And sometimes a little bit steeper. For the rest of the day we did not make any further plans. Searching for animals sometimes was physically quite exhausting. Thus, we intended to relax as much as possible in Guarapari before our next animal encounters started. 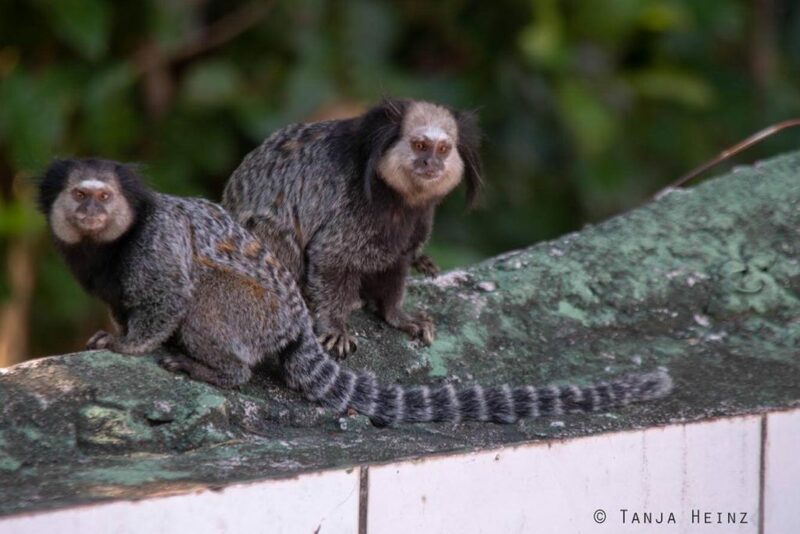 I was already looking forward to the common marmosets at the Sugarloaf and Golden lion tamarins in Silva Jardim. Guarapari does not have an airport. The closest airport is the one in Vitória. That means the airport Eurico de Aguiar Salles. There are no (not yet) direct flights from Europe. However, there are several flights within Brazil that come and go to Vitória. The next international airports from Guarapari are in Rio de Janeiro, São Paulo or Belo Horizonte. We travelled with the bus company Planeta from Vitória to Guarapari. There are regular busses from the capital of Espírito Santo with Planeta. It is possible to buy a ticket directly in the bus. A bus ticket from Vitória to Guarapari costs about 15 R$ and the journey takes about one hour. By the way, the bus therminal in Guarapari is located a little bit outside of the city at the Av. Gov. Jones dos Santos Neves, 10329 – Várzea Nova, Guarapari. Therefore, we had to take a taxi from the bus terminal to our Airbnb accomodation in Guarapari. When we left Guarapari staff of our Pousada ordered Uber for us. In Guarapari we stayed at a Pousada. And that is in the Pousada Mar e Mata in the Av. Celso Bastos Couto, 11 – Praia do Morro, 29216-110 Guarapari. For two nights and two persons we paid 350 R$ at Mar e Mata. Breakfast was included in the price. Actually we booked an accomodation via Airbnb. Unfortunately we could not find the accommodation. We also could not contact the host of the Airbnb accommodation when we arrived late in the evening. It was already very late after 10 p.m. We thought to be in the right street (we were), but it was dark and the neighbors did not know our Airbnb host. We decided to look for a Pousada close-by. At the end, we were in the right street, but I had the wrong number of the house. I took the house number of the invoice. In another document was the same street, but with the right house number. Unfortunately, we had no mobile phone. That means we had no SIM card. I recommend to everyone travelling with a mobile phone. Although certainly I do not have to say that as probably most people travel with a mobile phone (and we are one of the few ones who do/did not). However, I also have to add that in Brazil it is not so easy to get a SIM card. We needed one month to get one (and it only worked because of a Brazilian friend). In this situation in Guarapari I would have preferred trying to contact the Airbnb host for a litle bit longer, but we relied on the neigbors and so we couldn’t try it.